Zaha Hadid. Photo by Steve Double. Youk Chhang, Director of the Cambodian Documentation Center, and Zaha Hadid announce the appointment of Ms. Hadid's firm to design the new Sleuk Rith Institute, the permanent successor to the Center, in Phnom Penh. 28 October, 2013. The Documentation Center of Cambodia (DC-Cam) was established in 1995 to chronicle the brutality of the Khmer Rouge era. With an archive of nearly one million documents, DC-Cam has built a reputation as a leader in the quest for memory and justice, with the goal of not only recording Cambodia's tragic history, but also helping the nation recover. The new Sleuk Rith Institute will be the leading center for genocide studies in Asia'a place for the organization to continue its work compiling, analyzing and preserving information related to the Khmer Rouge era. The site, adjacent to a new public library and law faculty of the royal university of law and economics in Phnom Penh, was donated by the Cambodian government in 2008. The choice of Ms. Hadid's firm, renowned for its ground-breaking architecture, reflects the decision by DC-Cam to break with the model of memorial architecture that tends to be dark and overbearing. Mr Chhang said; "Although the association with the negative consequences certainly has its place, it reflects neither the direction nor the intent of pursuing the creation of a monument to the memory of the victims of the Khmer Rouge Regime in Cambodia. The Documentation Center's vision certainly remembers the past, but looks primarily to the future, offering an optimistic experience that reflects the ambitions and aspirations of the nation. The Sleuk Rith institute will adjust how we approach this specialized field of memorial architecture, resulting in a serious but less-onerous, more balanced, visitor experience with an optimism that looks to the future. 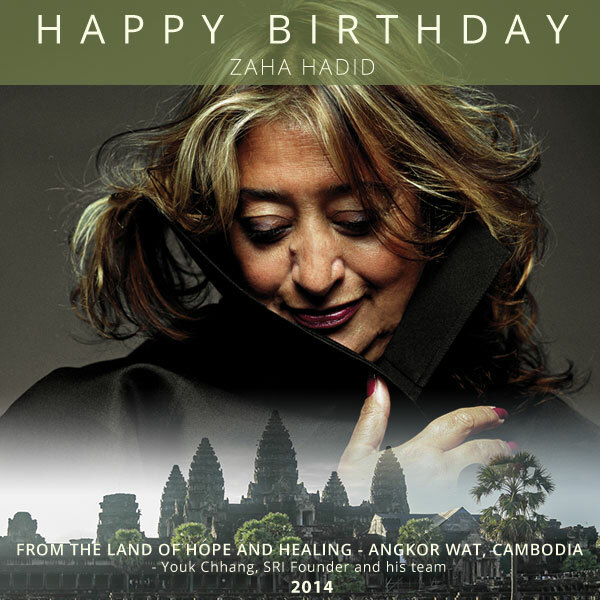 The gracious but powerful architectural language of Zaha Hadid focuses on the curvilinear; it has the potential to shift the dominant design approach of commemorative architecture in an entirely new and more enriching direction." 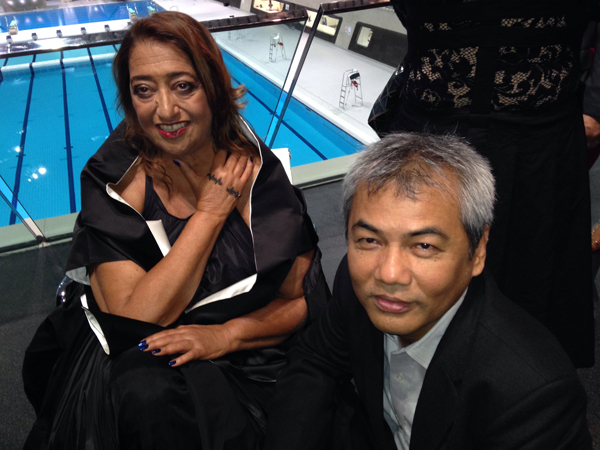 Zaha Hadid said: "Youk Chhang's vision is inspirational. His brief for the Sleuk Rith Institute calls for beauty and an optimism for the future to heal and reconnect a country, with the Documentation Centre of Cambodia being key to that process. Working with Youk Chhang and the Institute, we have brought together an excellent team of Cambodian and international consultants that share this vision to carefully plan the Sleuk Rith Institute. Cambodia's rich cultural heritage includes some of the world's most exceptional temples that reflect the extraordinary architecture and technologies of their period. We look forward to working with Youk Chhang and his team to realize his vision in a contemporary building that remembers the past, but also reflects the unwavering belief and optimism for the future using education, understanding and inspiration to positively engage visitors." Visitors to the Phnom Penh facility will learn the tragic legacy of the Khmer Rouge, remembering the victims as human beings unwittingly caught in the vortex of war, extremist ideology, and irrationality, the new Institute will focus on ensuring against a resurgence of those conditions through a variety of instructional programs. Visitors will learn how the values associated with knowledge, forgiveness, reconciliation and understanding provide a means for more productively and positively engaging the future. They will also learn how to place the events precipitated by the Khmer Rouge Regime into the larger context of Cambodia's lengthy history. Youk Chhang and Zaha Hadid anticipate the new Sleuk Rith Institute's beauty and symbolism will be commensurate with the institute's vision; a project that will serve to build upon and strengthen the work of the Documentation Center, increase public awareness and understanding and pursue the social benefits of reconciliation through education, immersion and closure based on remembrance and commitment. Mr. Chhang and his colleagues are proud and grateful that Ms. Hadid and her design team have joined with them in this project. Youk Chhang is the Executive Director of the Documentation Center of Cambodia (DC-Cam) and a survivor of the Khmer Rouge's "killing fields." He became DC-Cam's leader in 1995, when the Center was founded as a field office of Yale University's Cambodian Genocide Program to conduct research, training and documentation relating to the Khmer Rouge regime. Chhang continued to run the Center after its inception as an independent Cambodian non-governmental organization in 1997 and is currently building on DC-Cam's work to establish the Sleuk Rith Institute, a permanent hub for genocide studies in Asia, based in Phnom Penh. Before leading DC-Cam, Chhang managed human rights and democracy training programs in Cambodia for the U.S.-based International Republican Institute and was an international staff member assisting the Electoral Component of the United Nations Transitional Authority in Cambodia (UNTAC). From 1989 to 1992, he worked on crime prevention in Dallas, Texas. Chhang is a Senior Research Fellow at the Center for the Study of Genocide, Conflict Resolution, and Human Rights at Rutgers University-Newark. He was a member of the eminent persons group who founded the Institute for International Criminal Investigations in The Hague in 2003. He is also a Board Trustee of Air Asia. Chhang is the author of several articles and book chapters on Cambodia's quest for memory and justice and is the co-editor of Cambodia's Hidden Scars: Trauma Psychology in the Wake of the Khmer Rouge (2011). Chhang is also the executive producer of a documentary film entitled A River Changes Course (2012), known as Kbang Tik Tonle in Khmer, about the changing social, economic, and environmental landscape in Cambodia. Among other awards, that film won the 2013 World Cinema Grand Jury Prize for documentaries at the Sundance Film Festival. He received the Truman-Reagan Freedom Award from the Victims of Communism Memorial Foundation in Washington, DC in 2000. He was named one of TIME magazine's "60 Asian heroes" in 2006 and one of the "Time 100" most influential people in the world in 2007 for his stand against impunity in Cambodia, Iraq, Myanmar/Burma, and Syria. Zaha Hadid, founder of Zaha Hadid Architects, was awarded the Pritzker Architecture Prize (considered to be the Nobel Prize of architecture) in 2004 and is internationally known for her built, theoretical and academic work. Each of her dynamic and pioneering projects builds on over thirty years of exploration and research in the interrelated fields of urbanism, architecture and design. Born in Baghdad, Iraq in 1950, Hadid studied mathematics at the American University of Beirut before moving to London in 1972 to attend the Architectural Association (AA) School where she was awarded the Diploma Prize in 1977. She founded Zaha Hadid Architects in 1979 and completed her first building, the Vitra Fire Station, Germany in 1993. Hadid taught at the AA School until 1987 and has since held numerous chairs and guest professorships at universities around the world. She is currently a professor at the University of Applied Arts in Vienna and visiting professor of Architectural Design at Yale University. The MAXXI: National Museum of 21st Century Arts in Rome, Italy and the London Aquatics Centre for the 2012 Olympic Games are excellent manifestos of Hadid's quest for complex, fluid space. Previous seminal buildings such as the Rosenthal Center for Contemporary Art in Cincinnati and the Guangzhou Opera House in China have also been hailed as architecture that looks to the future with new spatial concepts and dynamic, visionary forms. Hadid's outstanding contribution to the architectural profession continues to be acknowledged by the most world's most respected institutions including the Forbes List of the World's Most Powerful Women and the Japan Art Association presenting her with the "Praemium Imperiale". In 2010 and 2011, her designs were awarded the Stirling Prize, one of architecture's highest accolades, by the Royal Institute of British Architects. Other recent awards include UNESCO naming Hadid as an "Artist for Peace", the Republic of France honouring Hadid with the "Commandeur de l'Ordre des Arts et des Lettres", TIME magazine included her in their list of the "100 Most Influential People in the World" and in 2012, Zaha Hadid was made a Dame Commander of the Order of the British Empire by Queen Elizabeth II.